Despite all the low-carb, no-carb talk these days, your body needs carbohydrates. It's where those carbs come from that makes the difference. Refined flours and sugars have huge carb counts but offer little else in the way of nutrition and provide nothing to sustain you. Fruits and vegetables provide carbohydrates, but whole grains are another great way to get a nutritional punch with your carbs. Getting the best nutrition comes from eating a wide variety of healthy foods. Expand your horizons beyond whole wheat (and consider dropping the refined white flour entirely), and check out these fun – and slightly funky-sounding – whole grains. 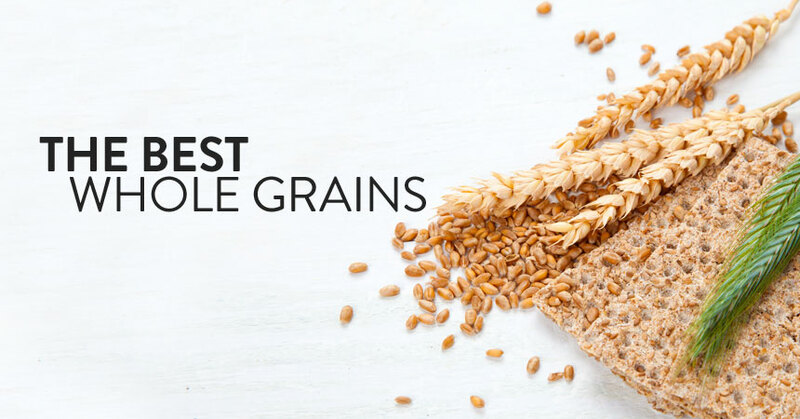 Here are some whole grains you may not know about and may want to consider adding to your diet. Some rye breads may help lower the body’s insulin response and suppress hunger, according to Lund University in Sweden. A Finnish study found that people at genetic risk for Type 2 diabetes who eat rye (as opposed to potatoes, rice or wheat) “down-regulated” their diabetes risk. Basically, the study found that diets rich in whole-grain cereals and foods with a low glycemic index, such as rye, might help protect against the onset of Type 2 diabetes. Buckwheat also contains high levels of both protein and soluble fiber, helping slow the absorption rate of glucose. Buckwheat lends itself very well to pancakes, but it also shines in other foods, from blinis to savory side dishes. Oh, and about that "wheat" word? Buckwheat is in no way related to wheat and contains no gluten (remember, it's not even a grain), making it safe for those with celiac disease. A tiny, gluten-free and quick-cooking grain, teff has the highest calcium content of any grain and has loads of Vitamin C. Teff is an ancient grain from Northern Africa and has a slightly sweet flavor. Since it is slowly digested, it helps maintain healthy blood sugar levels and delivers a high mineral and fiber content. Farro, or faro, was the heart of many ancient Romans' daily meals, and it is sometimes called “the mother of all wheat.”4 Farro is high in fiber and protein and contains cyanogenic glycosides, substances that improve the immune system and lower cholesterol, along with B vitamins and magnesium. Amaranth is truly a grain of the Americas. Native to South America, Amaranth is a small gluten-free grain with a spicy flavor. It is also a great grain choice for those with celiac disease because it is loaded with protein and amino acids, in addition to calcium and Vitamin C. Amaranth may aid in the prevention and treatment of several health conditions. A Mexican university study found amaranth might have cancer and inflammation preventing properties. Amaranth and amaranth oil may help reduce high cholesterol, according to a U.S. Dept. of Agriculture study. Popular in Africa and India, millet is a grain that looks sort of like birdseed. In fact, many birdseed mixes contain millet. But millet is a high-protein grain that is also high in antioxidants and may reduce high triglyceride levels, according to studies from Memorial University of Newfoundland, Canada and Hanyang University in Seoul, South Korea. Safe for those with celiac disease, sorghum may help fight tumors, protect against diabetes and lower cholesterol. Adapted to growing in hot, arid conditions, sorghum originated in Northeastern Africa, and was domesticated between 5,000 and 8,000 years ago, according to CGIAR. Sorghum, sometimes also called milo, is a dietary mainstay for many “food insecure” people in Africa and Asia. One serving dishes up more than 5 grams of protein. A type of wheat, whole grain Kamut provides over 40 percent more protein per serving than regular wheat and more protein than an egg.5 Sometimes called the “sweet wheat” because of its lack of bitterness, Kamut originated in the fertile crescent of Mesopotamia and in Egypt. An American aviator allegedly brought the wheat to the U.S. from a tomb in Egypt after World War II. Although the origin story is highly debatable, it earned the ancient wheat the nicknames "King Tut's Wheat" and "Pharaoh grain"6; Kamut is actually the brand name. Obviously, different grains provide different benefits, but adding more whole grains of any kind to your diet can increase your fiber intake and help you stay full longer. Eat only whole grain cereals and breads and add more “exotic” whole grains to soups and stews. With the wealth of choices available, there's really no excuse for not including whole grains in at least one meal every day. Oumar, Ibrahima, Cédric Mariac, Jean-Louis Pham, and Yves Vigouroux. "Phylogeny and Origin of Pearl Millet (Pennisetum Glaucum [L.] R. Br) as Revealed by Microsatellite Loci." Theoretical and Applied Genetics 117.4 (2008): 489-97. Web. "Organic Farro." Bob's Red Mill. N.p., n.d. Web. 12 Dec. 2014. <http://www.bobsredmill.com/organic-farro.html>. Skolnik, Heidi. "The Super Grains You Should Be Eating." The Dr. Oz Show. The Dr. Oz Show, 05 Mar. 2013. Web. 12 Dec. 2014. <http://www.doctoroz.com/article/super-grains-you-should-be-eating>. Quinn, Robert M. "Kamut®: Ancient Grain, New Cereal." American Society for Horticultural Science Press (1999): 182-83. Web. 12 Dec. 2014. <https://www.hort.purdue.edu/newcrop/proceedings1999/v4-182.html>.